The top five Ad Blitz commercials on YouTube, taken from the Super Bowl last month, saw more than 61 million views during the contest. Of those, 18 million were of Ram Trucks' two minute tribute commercial, Farmer. While most Super Bowl commercials were funny, goofy, or just plain weird and thus ended up with most of the attention from us journalists, the Ram commercial quietly paid tribute to the nation's farmers and their communities through a re-telling of Paul Harvey's So God Made a Farmer radio broadcast. The video's win means that Ram will donate $1 million to the National Future Farmers of America (FFA) Organization to encourage farming and ranching among the nation's youth. What's more, continued viewing and sharing of video "badges" from the Ram Trucks YouTube site will add even more to the donations, as the grassroots groundswell propelling the video's popularity continues to grow. 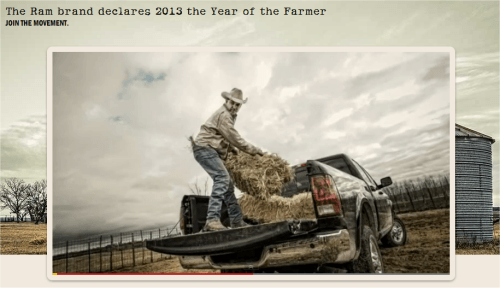 The video itself, embedded below, features Paul Harvey's speech with images of farm life from around the nation. It's a tribute to the extreme hard work, labors of love, hardship, and powerful sense of family and community that farmers enjoy uniquely in the American landscape. Having worked that life and continued to live among the American farmer, this Wyoming boy from Texas and Utah can tell you that the tribute from Ram is well met and often shared. The video below is deserving of the Ad Blitz win and after viewing it, you'll understand why it took more than 29% of the total video views for those top five contenders.